We all know the Earth is warming because humans are emitting greenhouse gases into the atmosphere. We’ve also heard that the Arctic is doing horribly, hitting record sea ice lows for several of the past few months, thanks to recent hot weather that’s connected to a longer-term warming trend. The polar bear populations are projected to decline 30 percent by 2050. There might not be any late-summer sea ice by the 2030s. Ok, so what do we do about it? At least one group of scientists from Arizona State University feel that solution A, cleaning up our act and reducing our emissions, is probably not going to happen thanks to a lack of effective political leadership. So, they’ve offered an insane solution instead: Let’s just refreeze the ice ourselves with a hundred billion dollar engineering project and pretend things are fine. Before we explain how that would work, let’s talk about why polar ice is important. Most obviously, entire ecosystems rely on the Arctic having ice, including humans who use it for hunting and traveling. But also, the bright, white ice reflects sunlight, which keeps the whole planet cooler. Without that ice, our poles would absorb and trap more energy, increasing temperatures elsewhere—plus, the melting ice would release even more trapped greenhouse gas. Sea ice changes the density of ocean water, allowing it to better circulate. Our planet is a living thing, and a disease like polar ice loss can harm the entire system. The scientists behind the new study think that freezing more sea ice to replace what’s been lost in the Arctic may simply require a system of floating buoy pumps powered by wind turbines to bring more water to the surface. 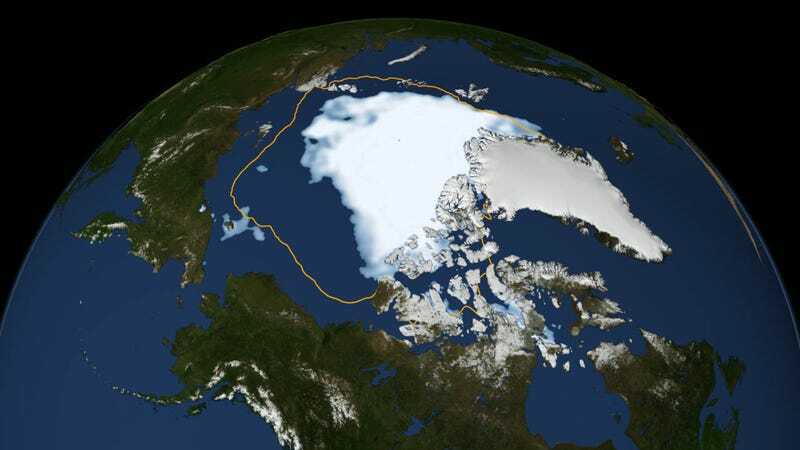 Surface ice and water keeps the deeper water insulated, but exposing that deeper water to the Arctic’s frigid -40 to -35 degree Celsius surface temperatures (-40 to -31 Fahrenheit) could help increase the sea ice thickness. The paper, published in the journal Earth’s Future, suggests that a “significant fraction” of the water pumped up from beneath the surface could turn to ice that sticks around for the winter. The paper was unclear on how deep the water would have to be pulled from, and whether the system would work if the surface temperatures rose to more alarming levels, and we’ve reached out to the authors for comment. The paper’s proposal is obviously wild, and comes with lots of challenges. Will there be the right amount of wind for the turbine to run consistently? How would we deploy the hundred million turbine-buoys across the entire Arctic required to complete such a project? Where would we get all the steel? “We estimate that deployment of devices over the entire Arctic in one year would consume essentially all of U.S. steel production, but only 6% of world production,” the authors write. All-in-all, such a project would cost around $500 billion per year over ten years to deploy pumps all over the Arctic, though the authors think that at just ten percent the scale, strategically-placed pumps could lead to an average one meter increase in ice thickness across the Arctic. I have no faith that such an idea would work, nor that we’ll ever solve the melting sea ice problem, because international cooperation is not humankind’s strong point. But we really need to do something about the Arctic sea ice loss, and it’s nice to imagine we can engineer away our problems with hundred billion dollar turbine projects. Plus, the authors themselves imply that if humans could afford The Manhattan Project that sent us into the nuclear era, then we can afford to refreeze the Arctic. Update 6:20 PM: Study author Hilairy Hartnett Scientist from Arizona State University told Gizmodo that the water needed only to come from a depth one to two meters below the ice, and such a method would work as long as Arctic sea ice temperatures stayed below the freezing point of seawater, around negative two degrees celsius.